Abhaya Simha was born and brought up in Mangalore (Karnataka, INDIA). After his graduation, got into Film and Television Institute of India, Pune. Abhaya Simha finished his direction course in 2006 and went to Bangalore to pursue a career in Kannada Film Industry. 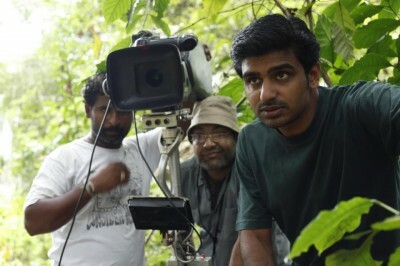 His first film Gubbachigalu (2008) won him the National Award for the Best Children’s Film and was screened in several International Film Festivals. His second feature film was a Kannada and Malyama bi-lingual film titled Shikari (2012) starred Malayalam Actor, Mammootty. Third film Sakkare (2013) was a Kannada film which was a romantic comedy starring Ganesh. He has also done documentary films, corporate films and campaign films in all these years. My grand father, G.T Narayana Rao was a well-known science writer in Kannada. My father had a bookshop and a publication house in Mangalore. Both of them had interest in theatre, literature etc. I think this had great influence on me during my formative years. Being from a small town, Mangalore the exposure to world cinema was not much at that time. Cinema interested me later when I took up photography. I don’t remember when I started writing for stage. However, during my graduation days, I accidently landed up in a situation where we had to make a documentary film. The process of making that film excited me. I was comfortable with still images so far. But when the images started moving, it created a lot of questions in my mind. Also I found a strange power in those moving images and the juxtaposition of those. This made me very interested in learning the art of film direction. Coming from a small town, Mangalore, I didn’t have much exposure to the film industry. So I had no idea as how I could formally train my self or get into the industry and learn on the job. It was then, I learnt about Film and Television Institute of India, Pune. I wrote the entrance exam in 2003 and was lucky to get the seat for Film Direction Specialisation. After FTII, I came back to Bangalore to assist a friend who was planning his first feature film. We worked on the script for two months. But unfortunately, the film was shelved at that point. So I started looking for work. It was at this time; I also started working on my first script, Gubbachigalu. It was a children’s film on environmental issues. I presented this script to a Kannada producer and he agreed to produce it. Thus my film career started. So I never had to assist anyone before starting off as a film director. When I came to Bangalore in 2007, I was hoping to assist a friend of mine. But when that project didn’t take off, I started looking for work in Bangalore film industry. It was at this point, another senior friend of mine, told me an interesting idea in a story form. This idea excited me and I started writing a script on that idea. As the script grew, we realised that it would become an interesting children’s film. Through a common friend, I met a producer and pitched the script. He liked the script and by end of 2007, we started pre-production of the film. It was a small budget film being made in Kannada. My FTII classmates, Dr. Vikram Shrivastava handled the cinematography (It was his independent film too) Anmol Bhave took care of the music for the film and also the sound designing. We shot the film in Super 16 and did an optical blow up. It was a wonderful experience doing that film. All our efforts got us wonderful returns in terms of visibility. The film not only won the National Award for Best Childrens film (2008) but also was screened in Indian Panorama at the International Film Festival of India, got selected to Kolkatta International Film Festival, Bangalore International Film Festival, New York International Independent Film Festival and many more. It was a memorable journey. How do you decide on a film subject? What are your inspirations? A journalist friend of mine in Bangalore proposed subject of my first film. It was about how fast sparrows are vanishing from our neighbourhood. Since these birds can be easily called as health indicators of urban ecology, it intrigued me. I was interested in wildlife activities for over 15 years then and was aware of things related to it, I was excited about the subject. As we did some research on the subject, script kept growing. A lot from my upbringing in Mangalore also came into the script. I think film direction is intuitive. But I also believe that this intuitiveness can be polished. Ways of audio-visual thinking can be groomed. We all think visually and narrate things with audio-visual experiences. I think film direction is a polished way of doing the same. I am still not sure as to what genre do I belong to. So far, in my three films, I have explored different narratives and genres. However, I have now started identifying things that I repeat in my narratives. With this, I am trying to figure out if there could be a pattern and so a genre where I would be comfortable. I think the audience is perceptive of the mis-en-scene created by the director. He may not be able to identify the way its done or the tricks used by the film maker. But the mis-en-scene is unconsciously perceived and enjoyed by audience giving them a complete pleasure of watching or hearing in the cinema hall. What is more important story or technique? If story is more important, then why not a book or theatre? I believe story and technique both are equally important. The technique on its own has no relevance if not applied to a story. At the same time, if the story isn’t told with right technique, fails to create the right impact it should have. A book, theatre presentation, music concert, painting all have their own way of creating the abstractness through which they engage the audience. Cinema has its own way of using concrete images to create the abstractness. Only when the right technique is used, this space gets created in the story, which elevates the story to the next level. I don’t really think too much about dealing with this issue. As a director, I am not here to proclaim my superiority over anyone else. Cinema is a huge financial activity due to its nature as a medium. So it is inevitable that market forces would get into action. Star system is a part of it. Though basically it would appear as film stars drive the film, as a director I too have got the option of not approaching someone for a particular role. I am responsible only to the final product. Film technology is continuously changing. Do you think it affects you as a director, in the way you want to tell stories? Yes. It affects me. The technology is not only changing in the way we create images. The change is also at the viewers end. How the images I created are seen also changes the way I create them. When I approach a story, I would understand generally what is the market to this story, what would be the place where this film would be seen most. Accordingly, the technology I choose is modified. What role does commerce play in filmmaking? Unlike most of other art forms, film is a medium where technology is a large portion of creation. This needs multiple people to handle the medium. This naturally increases the commercial aspect in the creation and exhibition of this art form. So commerce does play a huge role in filmmaking. What helps a film more the story or marketing? In today’s context, the marketing is surely helping to sell a film. The packaging has unfortunately become more important than the content! However for a long run, I still believe that the content will be the king. Any hurdles you have encountered in your journey. Things that are blocks in achieving your vision while making your film. There are so many practical issues, which always pop up while making a film. I believe if I am able to achieve at least 75% of what I had originally dreamt, I should be happy. It is always a difficult to get everything one wants. But then I guess life or cinema is always the same. The viewpoints will always differ. Everyone approaches a project for different reason. My new script is about 16th century Karnataka. Producers have come forward to do the film and we are planning the film. Every project starts as a dream project to me. Only by the end of it, I have new dreams. I hope it remains the same way. ‘Shikari’ is a film about neo-colonization that India faces today. It is said that we learn from history. But do we really learn? Abhijit, a software engineer finds few pages of a manuscript. The novel has a story from pre-independence India. Intrigued by the novel, he sets on a journey to search for the rest of the pages and story in it. In this journey, he meets Nanditha, daughter of the author of the novel. She joins Abhijit in the search for ‘Shikari’. Soon both of them start finding parallels to the historical story in their own life! Their lives and the characters from the novel all soon start intertwining! What happens next is a journey into the secret corners of the consciousness of today’s India! Sakkare, a romantic comedy starring Ganesh.